By Michelle Lipp Leave a Comment · This content may contain affiliate links. The incredible, edible herb? Even if you don’t have a huge space outdoors for planting, or any space at all, you can have an herb garden! You can plant herbs in containers, you can grow some in water, you can house them indoors given proper lighting and outdoors given the proper temperature. You can savor the flavors in the dead of winter from your kitchen window. You can dry them, freeze them, cook and can your own preserves or make your own tea. 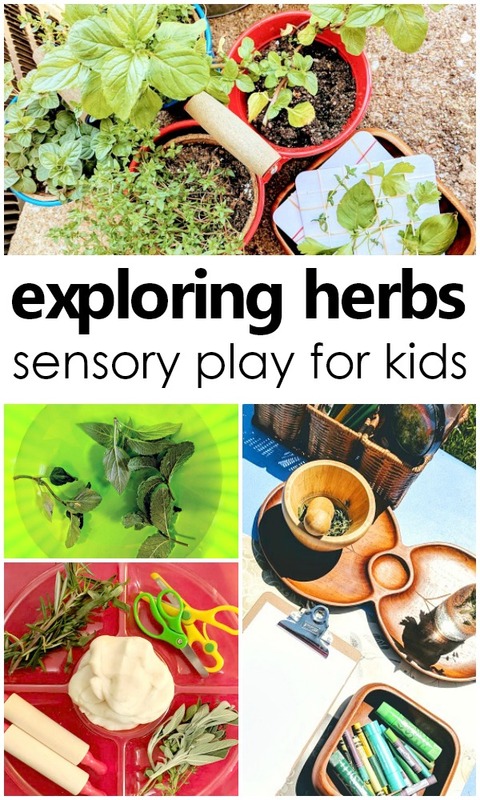 The options are as endless as varieties, and there are so many ways to herb sensory play activities to explore. For children (and adults like me), the beginnings of a garden have all the hope and potential in the world. And then there is the waiting. The long, hot, sweaty waiting. Everyone needs a little reward along the way and herbs are your reward! 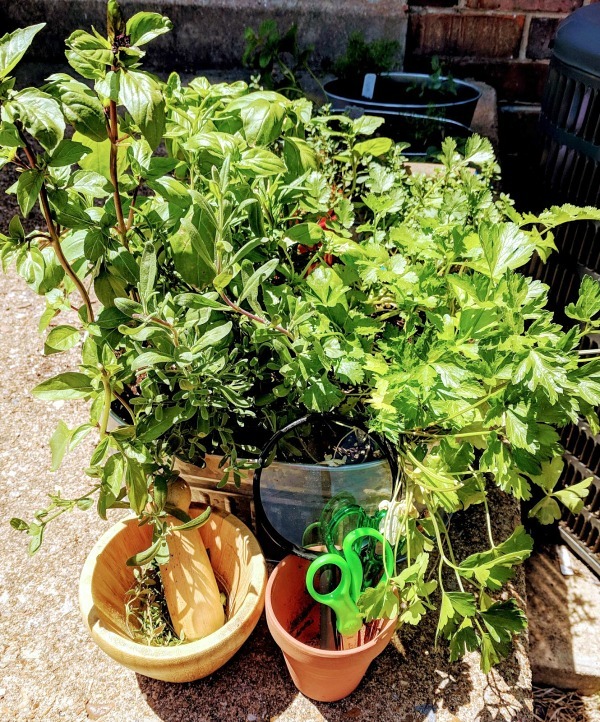 Herbs are a great way to share the garden-to-table experience in the comfort of your own home (and yard). These great activities will really get you digging into the garden and playing with your food! I recommend selecting a combination of herbs to plant from seed and some starter plants. Starting from seed allows the full range of gardening experience and choosing a few starter plants can allow for some instant gratification as you wait. Choose from some you know you like such as basil, parsley, mint and thyme and some that are new and unique, like lemon verbena or pineapple sage. 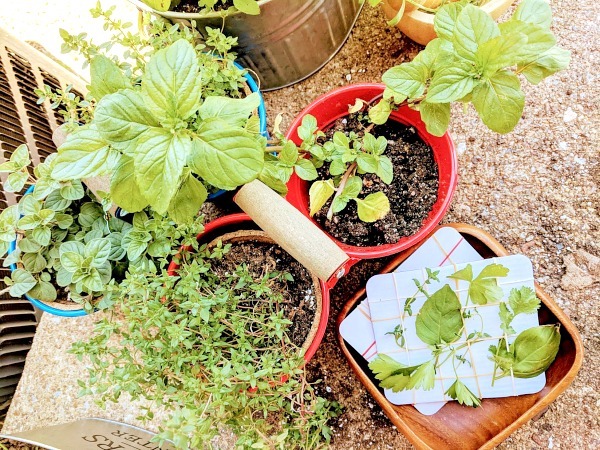 Cutting herbs, grinding herbs, smelling and handling herbs are great ways to combine fine motor skills and sensory play as your little gardeners help harvest and explore. It’s also an opportunity to talk about how and when to harvest herbs and plants in the garden. Herbs are so aromatic and gently rubbing the leaves between your thumb and forefinger can release their fragrance. 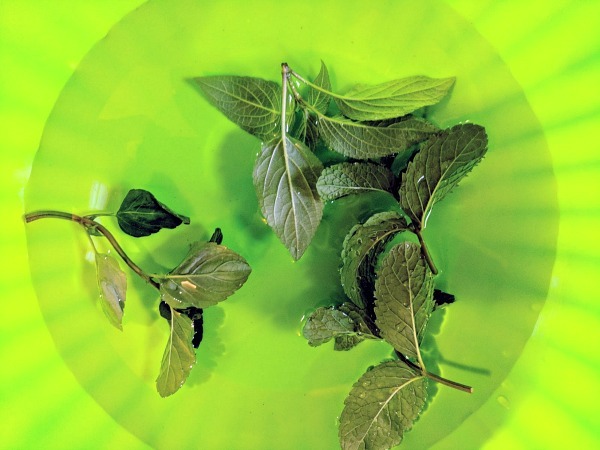 You might even try a sniff test to see if you can identify a familiar herb like mint by its scent alone! This is such a sweet and simple way to collect and display your nature findings, whether it’s from a patch of wildflowers, collected leaves and dandelions from the park or the sweet and savory scents from your herb garden. Using recycled cardboard and rubber bands, children can construct their own looms (younger ones may need an older assistant). Clipped herbs can be woven through the loom to create an aromatic decoration for your home or garden! Water play is a favorite activity among both my boys and this water table (or bowl or bin) idea is taste safe for the very young. Choose some herbs that smell particularly lovely together like mint or rosemary and lavender… You can add in some spoons for stirring, cups and containers for filling and pouring or just some eager hands! Herbs are so very lovely to look at. They almost beckon a budding artist to capture that beauty on paper or canvas. The garden in a great place to introduce the concept of still life drawing to young artists. Perfection or correct representation is certainly not the goal here, but rather child-led process art and the experience of drawing or painting or otherwise capturing what comes to mind when they view the targeted objects. A variety of mediums for coloring and paper alongside a glass jar of cut herbs were all that was needed to set up this simple still life. 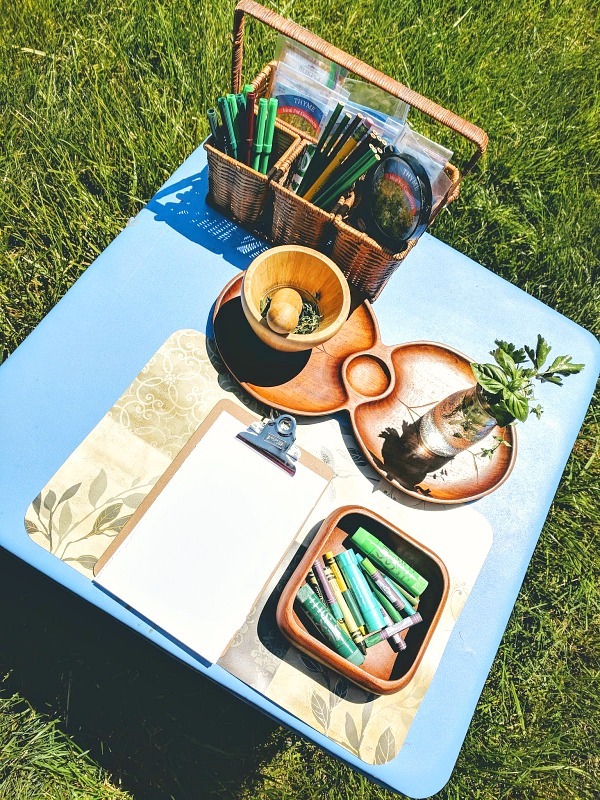 Alternatively, you can bring a sketchbook with you to the garden and have a pouch of colored pencils on the ready! Young artists may also enjoy arranging the still life as well. When I have seeds left over in a pack, I love to preserve them along with the packet in a snack-size ziplock bag. You can tape or staple the top for extra security if you wish. Children love to see what the seeds look like and compare it to the picture of the plant! You can even keep ziplock bags of seeds and corresponding seed packets separately and create your own herb seed match-it game. Be sure to leave an answer key for yourself! If you have as hard a time as I do getting your kids to come inside, you’ll need a really appealing lure. Making your own Herbed Garlic Bread Sticks might just do the trick. You can use your favorite pizza dough recipe (we like this one from Allrecipes) or buy ready-made if you prefer. Gather a selection of cut herbs like basil, oregano, parsley, rosemary and thyme and get all hands on deck for cutting (kitchen scissors with support, a child-friendly crinkle cutting knife or even a plastic knife work well) and knead those delicious herbs right into your dough before shaping and rolling some wiggly worm bread sticks. Coat with egg wash and sprinkle with some minced garlic, kosher salt and more herbs before baking according to your recipe. You can also use crescent roll dough and add in some fun cookie cutter shapes with this Easy Fall Bread Recipe. This is one of our favorite ways to play with our food! You can make your own play dough or use store-bought. Include some scissors for snipping, some sprigs of aromatic fresh or dried herbs and perhaps a rolling pin or some cookie cutters. 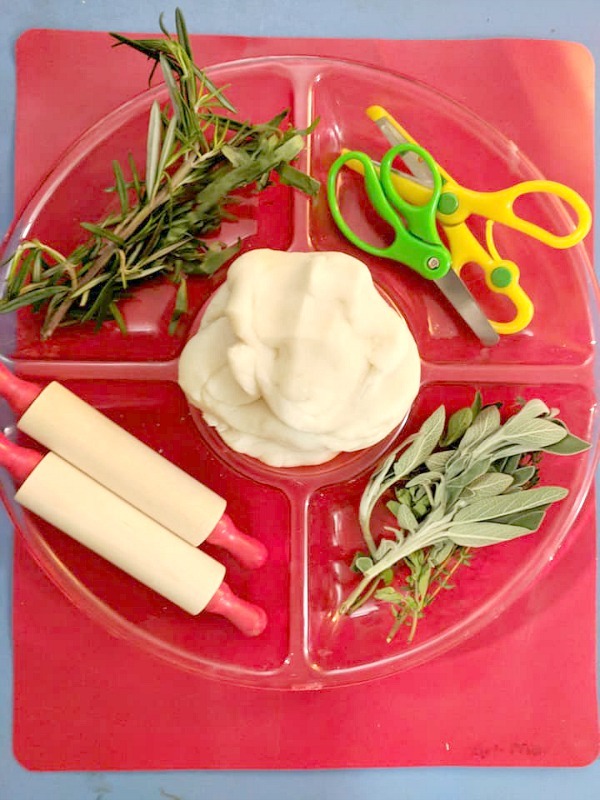 The herbs add such a wonderful scent and texture to play dough! Herbs can be a full sensory experience. From seed to sprout to harvest to table and everywhere in between, growing your own can make just about anyone feel like they have a green thumb. A few plants, plenty of sun and some water are all that you’ll need to keep these fresh flavors in your kitchen all year round while providing fun and learning for the whole family!